If housing more than one rug in a room, it is important to make sure the two pieces don’t clash. Matching rugs is a simple solution to ensure a cohesive look, but if you want to add dramatic flair, try mixing patterns. Patterned rugs with complementary colour schemes work well together in large spaces. Textures are a wonderful way of adding interest. Texture is more difficult to perfect than pattern but, if executed in the right way, can make a rug both a statement and a piece that is easy to live with, adding beauty to your room without overwhelming the scheme. Single or muted colours, if used with heavy or even light texture, can make both the rugs and your room more attractive. 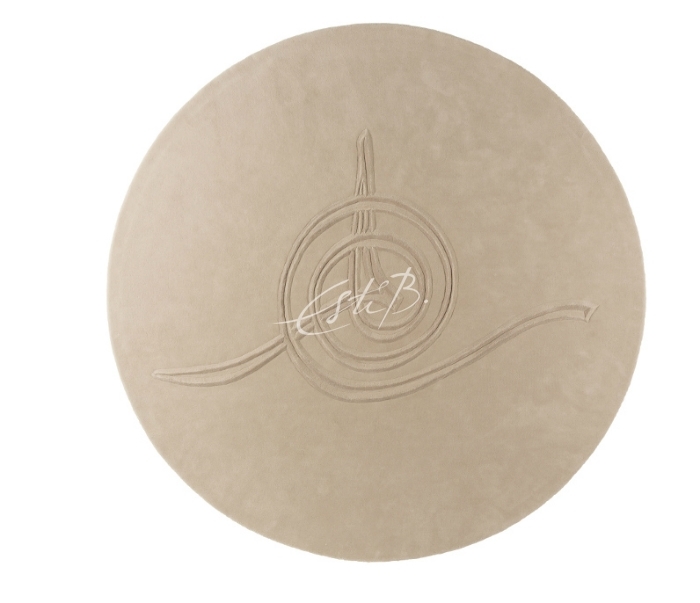 Our Esquire design is a beautifully textured yet neutral design that works well in many different settings. Contrary to popular belief, there is no law that says rugs have to be rectangular, and interesting shape rugs are perfect for adding a point of interest to a room. 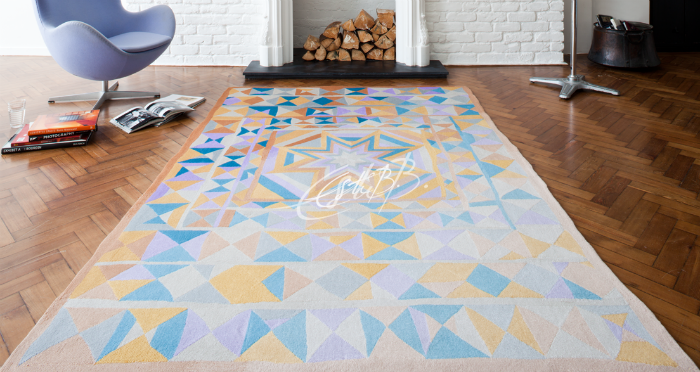 Even if made using a single colour, odd or geometric shapes can result in a rug that is eye-catching, fun and a great talking point. Don’t be afraid to venture away from traditional shapes. Another extreme not to be afraid of is the use of bold colour. 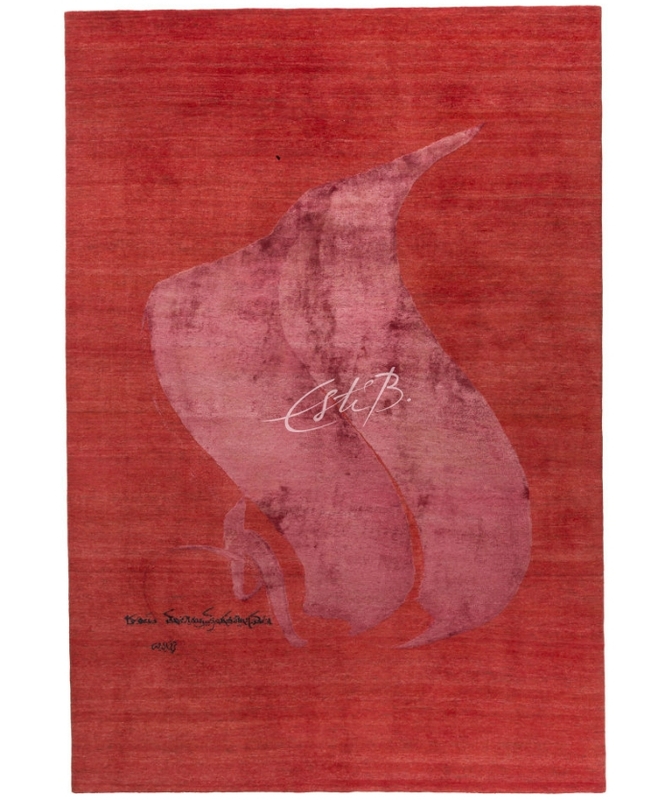 At Topfloor, we consider our rugs to be horizontal artworks, and believe they should be treated as such. Even if other elements in the room contain colourful patterns, rugs with colour can still work, and can even complement their surroundings, if selected carefully. We are always happy to advise clients on colour-matching rugs with existing interiors. The size of your rug is important. If it is too small, it can be lost in its surroundings, and can even make a room appear smaller. If it is too large, it can be overwhelming and its design impact is lost. Ensure you take your whole room into account when measuring, and find a rug that settles in perfectly with the rest of the interior. It’s a good idea to place rugs underneath furniture such as sofas. This will make the room feel bigger as well as prevent shoes from scuffing the rug’s edges. A very important factor to take into account is the quality of the rug you are buying. A lower quality piece may appear more affordable in the short term, but will ultimately cost you more in the long run as it ages badly. Invest in a high-quality, luxury piece and it will last you a long time, retaining its beauty. 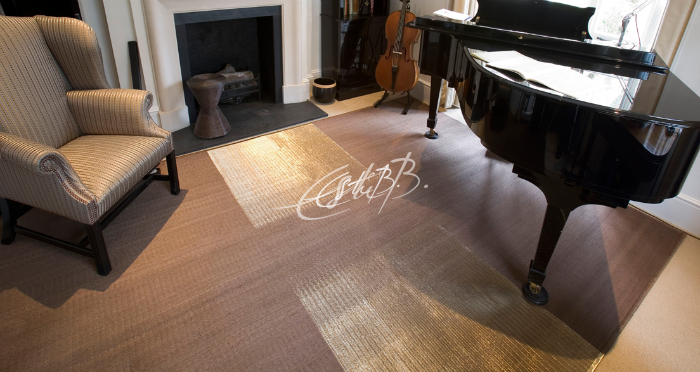 Unlike other flooring, rugs can also be taken with you when you move home, making them worthwhile investments. 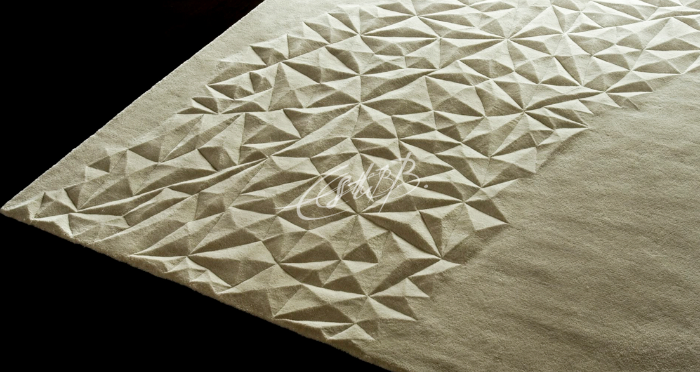 Where possible, it is always better to choose rugs with natural fibres. For wear, maintenance and softness, we suggest wool. For a luxurious sheen, we recommend silk. If you have budget constraints, bamboo is a wonderful alternative that looks similar to silk but is more hardwearing, as well as being environmentally friendly. 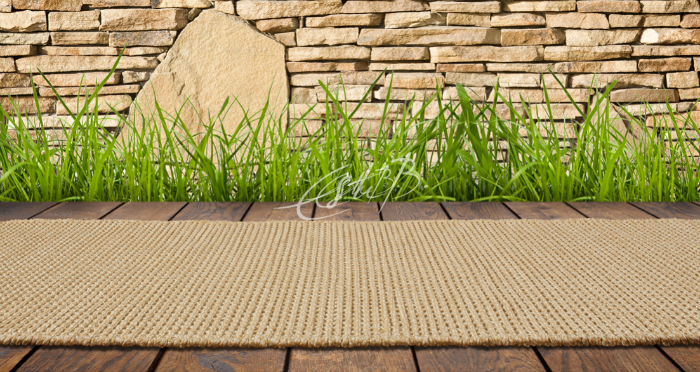 For outdoor rugs, our Rain or Shine collection features designs made from 100% polyester, making them hardwearing and waterproof, and even suitable for use in bathrooms. We hope that these tips have given you confidence and inspiration when it comes to choosing the perfect rug for your scheme. However, we are always happy to offer advice and inspiration on finding the right rug for you. Do drop into our showroom at Chelsea Design Centre, or call us on 020 7795 3333 to find out more about our services. My name is Hassan Massoudy. I was born in the South of Iraq, and at the age of 15 I went north to Baghdad to learn the calligrapher’s art. I stayed there for eight years, and learnt the traditional calligraphic styles. The main work for a calligrapher in Baghdad in those days was producing signs – purely commercial work. 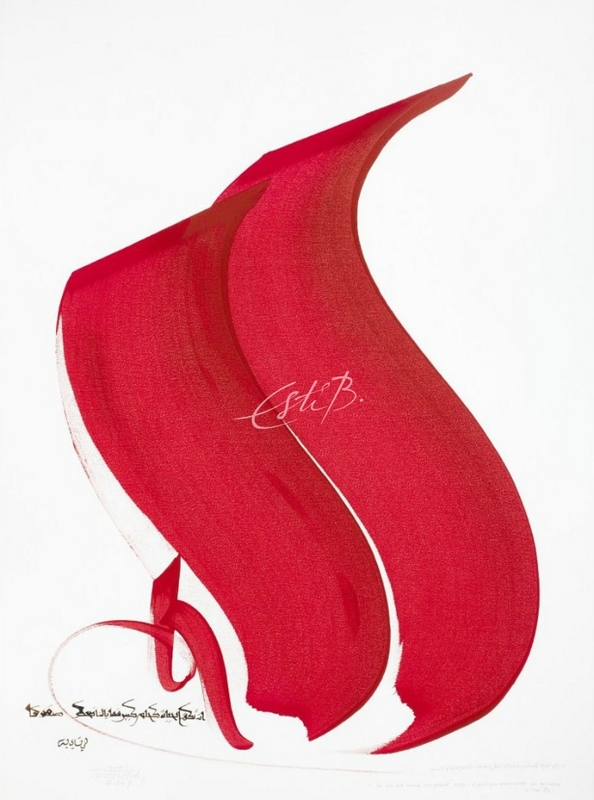 I myself wanted to create a more artistic kind of calligraphy so, in 1969, I came to Paris, and entered the Ecole des Beaux Arts – where I studied for five years, and received my National Superior Diploma in the Plastic Arts. Under the influence of the great master painters I practised most of the current styles of that time. It was Lyrical Abstraction that really captured my attention. 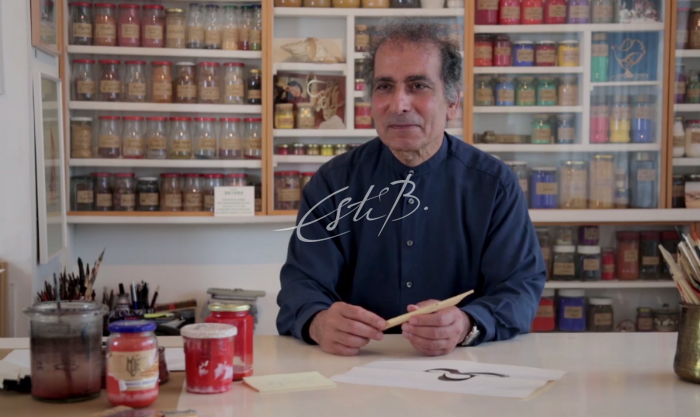 In some ways, it resembles calligraphy – I returned to Arabic calligraphy in mixing some of the elements I’d learnt at the Beaux Arts School with the things that I already knew from the ancient traditional calligraphers. After that I encountered, whilst still in Paris, Japanese and Chinese calligraphers –certainly an influence on my own work. It’s for this reason that my art has become a syncretic mix of so many different elements. 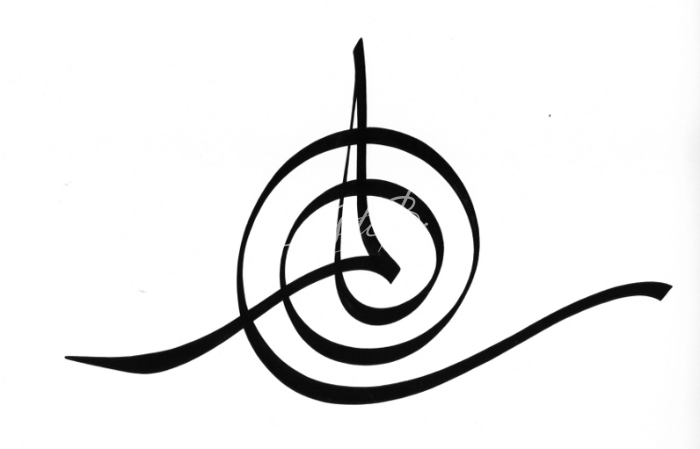 How long have you been interested in the art of calligraphy? Arabic calligraphy is something that exists inside of me, it’s something that I’ve loved since I was a child. When I was just four years old I would see my uncle doing his calligraphy. He was actually a theologian but also a great amateur calligrapher. When I came to Paris I marveled at the western Abstract Lyricism – you have the materials, you have painting, there is scale and you are working with the whole body. For the Japanese element what most struck me was that there is a balance between strength and simplicity. The absolute strength of the gestures and their rapidity – things unknown in the world of Arabic calligraphy – and the stark reduction, simply to black and white. You say your art is a mixture of different calligraphic styles – can you tell us about your personal approach to calligraphy? When one makes a gesture, one stops breathing, one cuts the respiratory system off, the lungs and everything connected are blocked. I have often tried with my granddaughter who is twelve years old. I give her an instrument and tell her to draw me a straight line – and she bites her tongue to do it! So, I think that it’s hard-wired with human beings that when one writes one stops breathing entirely. When one goes back to the inkwell – it also gives time to take in some more oxygen for the body. Now, the rapidity of the Japanese calligraphic style allows one to do many different things in a single second, whereas with our Arabic calligraphy, the slow steadiness means that it takes us a lot of time even to do quite a short line. So this marriage of oriental and occidental styles, which has happened in me, is difficult to explain in words. It remains within the language of the arts. But one senses that there are largeness and smallness, slowness, rapidity and length within these works – and it’s that which speaks to the spectator when they see these calligraphic works – they are sensitive to the timings that exist within the gestures expressed. 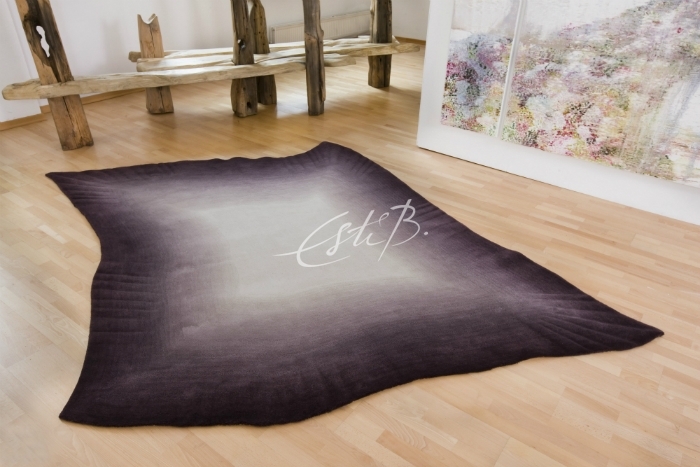 You recently worked with Esti Barnes, and Topfloor, on a new collection inspired by your work. Can you tell us about that? Sometimes in art, it’s a question of exchange, and of learning other people’s techniques as a way of nourishing my own path, so the potter who works in clay uses transparent colour, and that’s something close to my own interests; or dancers who specialise in movement and gesture. 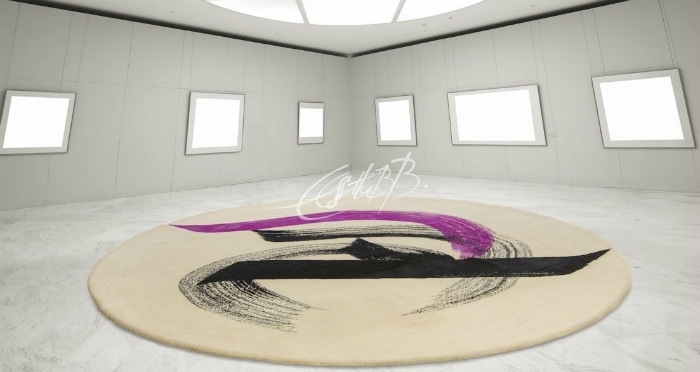 And so when Esti proposed to me the idea that she would make carpets that were inspired by my calligraphy, I said that she could if she found forms and colours that interested her, that she could use those things for herself. And those that I’ve seen have been very beautiful, there are some with calligraphy in relief, but which respect the elegance and the grace of the strokes. There are the colours – that she chose for herself – and certain forms that she has repeated. So it’s been an experience that I find most interesting. Esti’s idea of taking inspiration from my own calligraphy in the sand and to create such a carpet was really pleasing to me, and it’s what I am always saying about arts and artists – each one sheds light upon the other or gives another direction to the other – so here you have the art of a hand-made carpet which manages to convey something of the natural relief of writing in the sand.